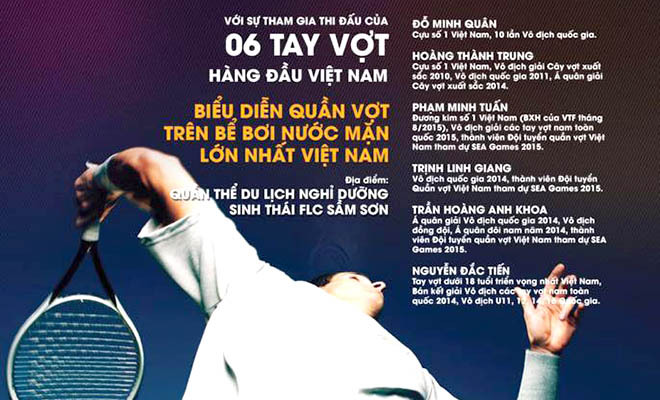 THANH HOA (VNS) — The FLC Tennis Cup 2015 will be held at FLC Sam Son Beach and Golf Resort in Thanh Hoa from tomorrow until Sunday. Many top Vietnamese tennis players, including Pham Minh Tuan and Trinh Linh Giang, who played in the final of this year's Viet Nam Men's Tennis Championships in the men's singles category, will attend the event. The match between Tuan and Do Minh Quan, who has been champion 10 times and has just come back from the United States, will be held on a tennis court floating on the surface of a 5,000 square metre pool . Other Vietnamese tennis players, including Hoang Thanh Trung, Tran Hoang Anh Khoa, Nguyen Dac Tien and Hiroki Horikiri, a guest player from Japan, will also compete for first prize worth VND30 million (US$1,340) and second prize of VND20 million ($890).